Wicca’s Wardrobe – Our first rigged, original Clothing Piece! Today I have a very special reason for my post… a very special vest for a very special friend! I am very happy that I can announce we are now able to even make rigged original clothing! What makes it even more special for me is that our first design was made for a very special Lady! Zoomy Bluebird, our reigning Miss CoC 2015. And even that contest is the reason for our new “Zoomy Vest”. It was not even long time planned, that we make something for Zoomy. We were working on the national costume for Miss SL Poland 2015 (yes, that one will be showcased soon too I just need to finish the pics :p) when Zoomy was in my IMs and told me she was searching for a cropped vest for one of her finale stylings. She said she looked already for quite some time and could not find what she wanted or the vest was not cooperating with the rest of her styling. The more we talked the more I got an idea, but I did not dare to ask her about as I did not wanna bother or obrude her too much. Then she all of sudden said she never would dare to ask me to make one, as she would know I would be busy with the gown anyways. You cannot imagine my smile in that moment… Zoomy was always a very dear friend to me over time, a crazy sister in mind and someone who always understood my weirdness. So you can imagine which honor it would be to create a piece for such an amazing woman! So I told her that I would LOVE to design something for her, but that I have to ask Veo and Red as well. We are a team in creating and already were working on other designs so I could not decide that on my own. I was very nervous what Veo would say about it though. Next day as soon as I saw him, I jumped on him, making super puppy eyes and told him about the idea for Zoomy’s cropped vest. I scribbled my idea on a piece of paper and showed him and he just nodded and said “Oh yeah we can do that”. You can imagine, it did not too even one second to jump back in Zoomy’s IM and tell her the good news. With her special style, the vest had to be in a certain look to mactch the rest of the styling. When he uploaded it and showed it to me I had goosebumps… that was exactly what I had in mind and it was fully rigged and everything! Besides the 3 colors for Zoomy I already made some more, because I totally fell in love with that vest :p.
It was a very special moment for me and as well for us all at Wicca’s Wardrobe. When Zoomy then, a few days later even won the Miss CoC 2015, you can imagine how much we were excited and happy. And now I am even more happy, that I may announce that the “Zoomy Vest” now is in store in 8 different textures to match as many different looks s you can imagine from casual to steampunk and even to the zoomylishious new style trend KAWA Couture! 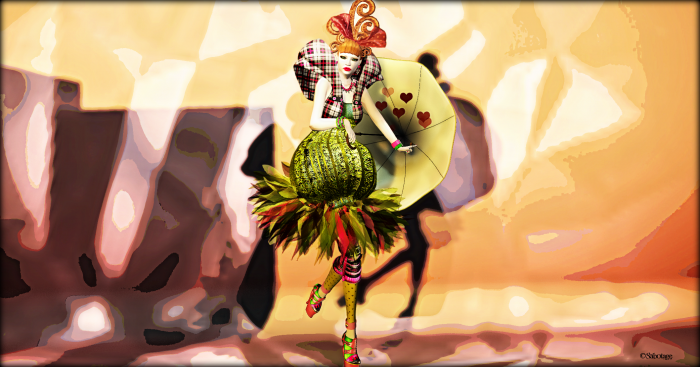 This entry was posted in Fashion and tagged [White~Widow], 3D, 3D people, Art, artilleri, asian, Avant Garde, avatar, Blog, Blogger, Clothing, Contest Winner, Couture, cropped vest, Dahriel, Digital Eyes, enVogue, enVougure, Fashion, Fashion in Pixels, fashion poses, Female Clothing, female wear, Giela Delpaso, GOS, Hair, High Fashion, japanese, Jewelry, Julie Hastings, KAWA Couture, Kawaii, LeeZu, LeeZu Baxter, meta virtual, Miss CoC, Miss Color of Couture, Model, model pose, Model Poses, Modeling, Modeling pose, Modeling Poses, Nailed It, neon colors, New, New Release, New Releases, News, photographer, polka dots, polkadots, Pose, Posesion, rickabilly, Second Life, Secondlife, SL, SL Clothing, SL Fashion, SL Style, Style, tartan, urban, Virtual World, White Widow, Wicca Merlin, Wicca's Wardrobe, woman, Zoomy Bluebird. Bookmark the permalink.